The Internal Medicine Residency program provides a perfect balance between hands-on patient care, faculty dedicated to resident education, and cutting-edge research opportunities. We are proud that our program is resident-centered and unequivocally resident-run, as evidenced by the numerous current practices – including the service structures and conference schedule – that were designed and implemented by the residents. Please explore this site to learn about our program, and feel free to email us at imresidency@virginia.edu if you have questions. 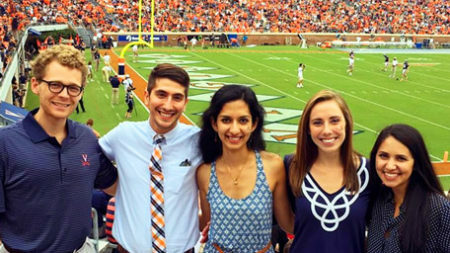 The University of Virginia Health System is a participating member of the National Resident Matching Program. 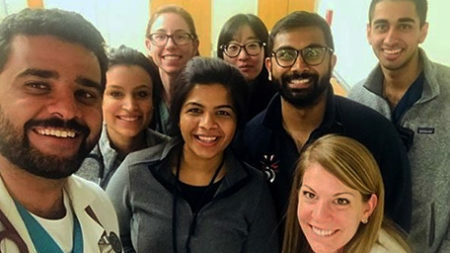 All applicants for first-year residency appointments at UVA must register with the NRMP, and all applications must be submitted via the Electronic Residency Application Service (ERAS). Creating and maintaining a climate of diversity and inclusion are priorities in the Department of Medicine. We recognize that diversity is an essential component in our efforts to continue, and to expand upon, the traditions of excellence at UVA. Life at UVA and in the Charlottesville-Albemarle mid-Atlantic region is a blend of interesting people, places, and opportunities for personal and professional growth. Learn about a day as an intern, health & wellness benefits, community service opportunities and salary and benefits. 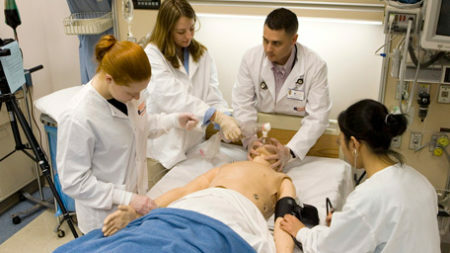 The University of Virginia Department of Medicine offers Fellowship Training in more than 10 specialties and subspecialties. Whether you are planning to go into a medical subspecialty, or a career in general medicine as a hospitalist or primary care physician, our residency program helps prepare you for that next step.